Have you seen a Tamil movie devoid of songs, heroine, punch dialogues, fights, heroism, comedy, villain, a love scene, a car chase?Here comes Unnai Pol Oruvan! !This movie,remake of Niraj Pandey's A Wednesday has nothing of the above mentioned gimmicks but still it makes the viewers glued to their seats for nearly two hours. 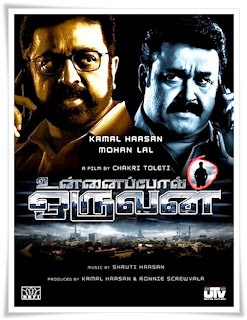 This movie is all about three entities,Kamal Hassan,Mohan Lal and a mobile phone.Hats off to the director for making a thriller out of nothing(Dont take the actors in to the count).The story is as thin as a wafer. "Terrorists should be given the taste of their own medicine".But the treatment of the story is commendable.The crew should be given a pat in their back for not tinkering with the story and the screenplay which is pretty much the same as the original. It is a dream come true for any movie buff to see the two legends of Indian Cinema coming together in a movie and they carry the whole movie on their shoulders with the ease of a veteran.Its disappointing though that we get to see both of them together only for a scene.All the other artists have done well,but they are simply overpowered by Kamal and Lal.This movie is a two men show,or maybe three if you take in to account Ganesh Venkatram.He sizzles as the police officer, Arif Khan.He is some one to watch out for! Technically this movie is far better than the original.Be it Chakri Toleti's flawless direction or Manoj Soni's cinematography or Rameshwar Bhagat's editing,its just about perfect.But the surprise packet is Shruthi Hassan's music.Her background score is amazing to say the least,for a newcomer.The clarity of sound,her ability to convey the scene's mood through her score underlines the fact that she had worked(or made to work) really hard for this movie. Not many times will you find a remake better than the original.But this movie is one of those few.I am in no way degrading the original movie A wednesday. Watch it and you will know the difference.